I like to think of the 4th Concerto as the time when Bach asks Ana Magadalena for her hand in marriage, to be mother to his children, and to have many more children together. This would have occurred around one year after Bach started writing the Brandenburg Concertos. Ecstasy, trepidation, hope and fear mix with terrible memories of his first wife, son and brothers deaths, and betrayal by his patron, that are barely a year old. It is a time of reaching out, the trauma healed just enough to trust again and see the goodness – and bad – in those around you. I think, with four young mouths to feed, time for contemplation was sparse, and composing was escape, relaxation, a touchstone during this period of transition to Bach’s future. They would have 13 children together and spend every day working together for almost the rest of their lives. The 4th Concerto has within it among the most beautiful elements, and also the hardest passages, demanding a virtuosity few have. 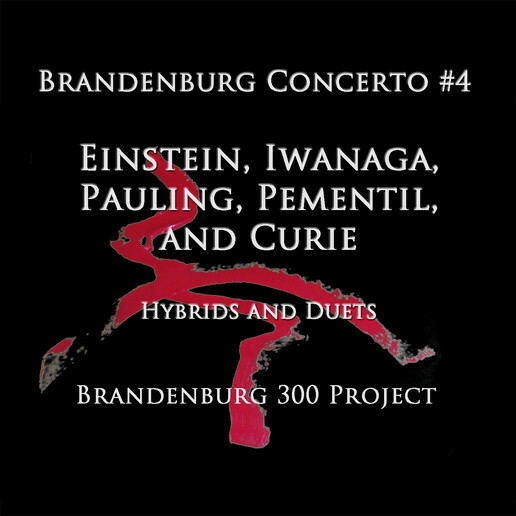 The 3rd Movement of the 4th Concerto is the fastest of all 23 Brandenburg Movements. The Honorees are three great scientists: Madame Marie Curie, Linus Pauling and Albert Einstein; and two regional heroes Helen Iwanaga – who, among many other things, organized bands and wrote music in the internment camps during World War II, and Lloyd Pemintel – who sang the children of a labor camp to bed every night after his 12 hour shift, ending each night by singing “You Are My Sunshine” to his own babies.